The Very Hungry Caterpillar is a phantasmagoric bodyshock horror story that focuses on the tenets of extreme gluttony and one creature’s psycho-compulsive desire to consume the world around him. Taking cues from Edgar Allan Poe and H.P. Lovecraft, The Very Hungry Caterpillar’s conception of horror isn’t a hyperbolic focus on blood and viscera, nor is it concerned with gothic notions of ghosts or death: rather, the anathema is an internalised grotesque; it is the body itself that is to be feared, treacherous from the inside and predisposed to intense bloating, mutation and the eventual emergence of the literal monster from within. 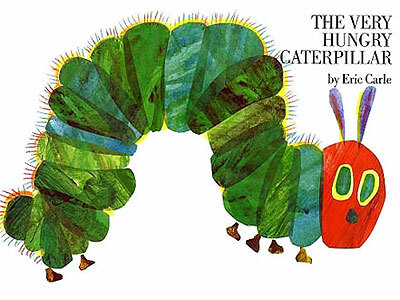 Whether or not the titular (yet never-named) Caterpillar’s gluttony is caused by some form of substance withdrawal, early childhood trauma, psychosis or hormonal imbalance is never made clear, as Eric Carle’s sparse and deliberately minimalist prose refuses to satisfy us with any kind of biography or context. I guess it’s down to the caprice of the individual reader whether or not the hubristic protagonist is eating to compensate for some tragic loss or unhappiness, or whether the book functions as a more simplistic parable and warning against greed as a moral vice. You could even read the work as a capitalist allegory; a sarcastic metaphor that criticises consumerist living and the compulsion to relentlessly use up even that which we don’t need. At about mid-way through the narrative, for example, the Caterpillar abandons the apples and foliage of his natural diet and turns instead to increasingly unsuitable and unnecessary processed foodstuffs: cakes, ice-cream, chocolates etc; he doesn’t need these things, but he is nonetheless beset with the urge to consume them, resulting in an inevitable sickness that can be only read as a kind of moral malady and existential ennui in the face of so much needless feeding of the self, something with which – in the current business environment of in-your-face marketing and the suggestion that an exponential increases in what we buy is the only path to happiness – I think we can all identify. Eric Carle’s familiar illustrative style is made noxious with a gross high-contrast palette of juxtaposed reds and greens that might function as a trippy visual call-back to hallucinatory substance abuse, perhaps hinting at the protagonist’s hidden and difficult past. The cut-and-paste nature of the art is reminiscent of Max Ernst, the early Twentieth-Century master of visionary Dada collage. What is most striking about The Very Hungry Caterpillar’s aesthetic, however, is the white and formless void in which the narrative action transpires. Whether this is a visual metaphor for the emptiness of the Caterpillar’s existence, or a literal representation of the world after it has been entirely devoured by our protagonist is never made clear – it could even be a psychologically sympathetic reflection of the Caterpillar’s own solipsism: all he sees, all that has meaning to him, is food and the self. In a highly creative manipulation of the book as a physical ‘artefact’, several pages have been punched-through with holes, providing the reader with a teasing glimpse at what’s coming next, which not only lends great pace and momentum to the work, but also provides us with a taste of the Caterpillar’s own mental state (and, indeed, the mental state of any addict) – always looking forward for the next meal, the next hit and the next and the next; wondering where it’s going to come from. The formless white void inhabited by “The Caterpillar”. Most shocking, however, is the book’s horrific dénouement in which (spoilers ahead…) the Caterpillar descends into a life of abject reclusion, shutting himself away for an undisclosed period of time before an act of eclosion which sees an entirely different creature emerge from the now empty shell of our hero’s grossly disproportionate and outsized body. There is some debate, as lepidopterists will tell you, over whether the emergent insect (the “butterfly”) is, in fact, an altogether separate species of animal from the crawling, wingless original. If this is the case, then the Butterfly could be read as a monstrous and parasitic ‘other’, hijacking our helpless protagonist from within and enforcing upon him a set of behavioural patterns beneficial to the waiting monster, but not the hero, namely: the aforementioned propensity for extreme greed, reinforcing The Very Hungry Caterpillar’s identity as a work of terror, in line with such classic horror staples as demonic possession or parasitic alien gestation. The Very Hungry Caterpillar is bildungsroman tragedy told via a pastiche of horror fiction mores and an unsettling convergence of disparate genre conventions: prose poem meets phantasmagoric dreamscape meets an examination of chronic loneliness, all fused with the suggestion of a loss so deep and painful that even when the hero devours the world until it is reduced to an empty white nothingness, the suffering remains. Perhaps the inescapable punched-out fissures in the book’s pages expose The Very Hungry Caterpillar’s real subject and message, the cores of hurt that persist through everything: the holes that can’t be filled. This entry was posted in Reviews and tagged Eric Carle, The Very Hungry Caterpillar. Bookmark the permalink. This is the kind of post that justifies blogging. Marvellous! Hahahahaha this has just made me laugh and laugh and laugh and laugh! Brilliant! Having read this umpteen times to my toddler, this made my day. I think it’s brilliant. I’m reminded of a character in a Tim Powers novel, an immensely fat man who devours all he can determined to bury his own skeleton in fat so he can deny the fact of his own mortality. Here I think the consumerist analogy is the best one, from your description. The end transformation seems comparable to that in dystopic novels like Yevgeny Zamyatin’s We. By embracing consumerism the caterpillar seems reborn, but is in fact replaced with a socially acceptable member of society – seemingly beautiful but with the ugly individuality of the original person quite removed. Of course, to another reader it could be read quite differently – the radical coming to accept conformity and through that casting aside the doubts and fears that hold them to the earth. I would expect the right to embrace this as much as the left, leaving a question as to the author’s real motive in writing it. Absolutely in tears. Easily the most favourite link I’ve ever clicked, now to plug it vigorously across any social platforms I possibly can. I thank you for bringing thsi gem into the world. oh my dear lord, this is a delight. I study children’s/YA lit (i’m trying to finish my dissertation) and this makes me happy beyond description.  I really, really, REALLY love thinking of The Very Hungry Caterpillar as “phantasmagoric bodyshock horror story.” I also love your helpful insertion of an image of the formless white void in which The Caterpillar lives. best blog post of the year, on any subject, I think. Many thanks for taking the time to read and comment. And for some reason, no-one ever comments on how the caterpillar’s expression recalls the existential terror of Munch’s ‘Der Schrei der Natur’.